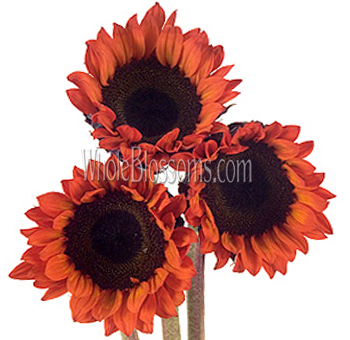 Sunflowers are long-lasting and come in a beautiful assortment of colors that have a light or dark center. You can choose the traditional yellow variety or the more exotic flaming red or Teddy sunflowers. They are delivered direct to you from the farm. Be sure to consider both light and dark center colored varieties when buying yellow varieties. They are available year-round though certain varieties are seasonal and may not be available. We recommend ordering at least one month before your wedding or event to ensure color availability. They are cut within 24 hours of delivery to ensure that you receive only the freshest selections. Remember that they arrive as closed buds so they need hydrated right away so that the heads open fully and give you the maximum amount of vase-life. If your flowers still are not opening after 24 hours in water, please contact us so we can provide you with tips to accelerate the opening process. 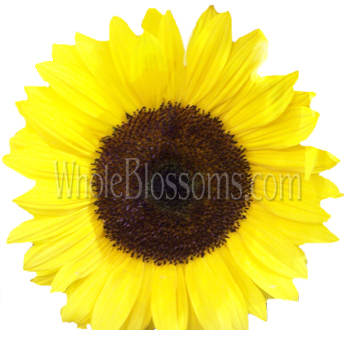 We will not refund or reship sunflowers that do not open or that arrive crooked. You surely know of the sunflower, a universal message of happiness and courage! It originated in Mexico before it came to America. The flower is prevalent even in cultures of Central, Southeast and Middle East Asia. The bright sunflower is a symbol of warmth, positivity, and energy. It is very popular in homes and weddings for its cheerfulness. The sunflower is named after the sun because of its shape and color. They truly bring a smile top a bystander's face! This flower can be used in a variety of occasions and with many types of flowers. It can come in a variety of colors. Though yellow is the most common, you will find sunflowers in the shade of orange, red, mahogany and burgundy. But it is most famously used in wedding bouquets. The sunflower is made up of a number of individual flowers. The center of the flower is spiral, which follows the Fibonacci sequence.The sunflower’s bright yellow color gives it a summery feeling. Which is just as well, because it is very tolerant of heat. The sunflower has a rough and sturdy stem that typically grows to 3m in height.The leaves are of dark and soothing green.In the wild, you can find many flower heads on a single stem.Butflorists grow a single sunflower on a stem.This makes them easier to use on bouquets. They're great even as a single flower. The sunflower comes in many varieties. 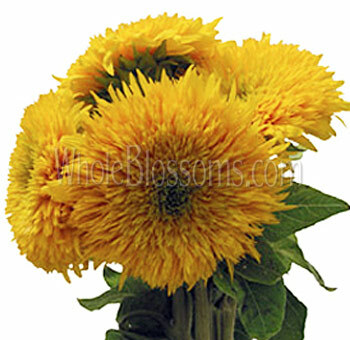 Teddy Bear sunflower is a cuddly-looking dwarf plant with a vast number of flowers. The Italian White sunflower is another popular variety. 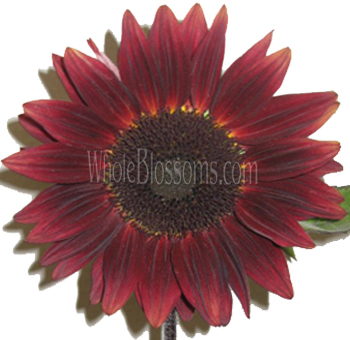 And the Chocolate sunflower is a favorite, with its deep mahogany-burgundy color.The flower has many significances. It is often related to the story of a nymph who was in love with the Greek god of the sun, Apollo.The sunflower is also the national flower of Ukraine.The sunflower’s seeds and oil are used often in cuisine. The flower is very hardy and robust. It was used to remove radioactive material from the earth in a process called phytoremediation. You can see how special and unique the sunflower is. It represents and is a symbol of strength, beauty, and resilience. 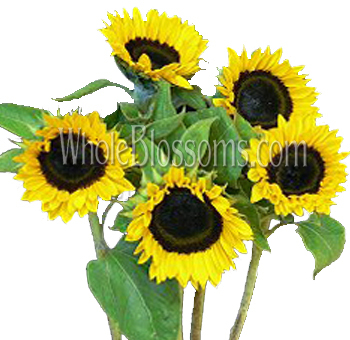 The sunflower is extremely popular in bouquets. It is used in mix bouquets, home décor and gifts to friends. There are several varieties in color and shape. But you’ll most commonly find them in weddings. This is because they are a symbol of affection and adoration. In wedding bouquets, the sunflower is used alongside white flowers and ribbons. They are used with purple roses for a winter wedding, and they look absolutely gorgeous. They will look even better with red, orange and pink flowers for a fall wedding. This flower is perfect if you're going for a rustic themed wedding. It's welcoming, warm and affectionate, which suits a day for the commemoration of love.In centerpieces, you can use sunflowers alone to create a fantastic look. The sunflowers light up the room singlehandedly in a vase by themselves. Adding a bit of leafy green foliage will enhance their beauty. Just pop them in a transparent vase and let them do the rest. Bulk red sunflowers and yellow sunflowers are great for this purpose. The sunflowers can be used with a variety of other flowers too. Its large shape and agreeable nature make them essential in flower arrangements. When used with daisies of a variety of colors, they bring about a beautiful look. 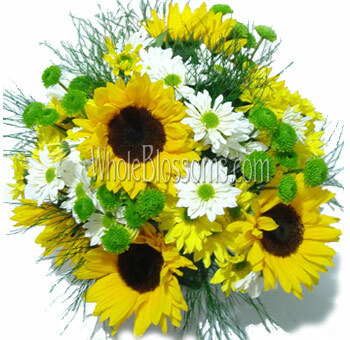 Sunflowers are very popularly used with rose, yarrow, and delphiniums. It gives the whole bouquet a lot of depth and splendor. The sunflower stands for positivity and warmth, so they’re a universal message to everyone. The sunflower can convey a message of healing and long life. It's a great gift to someone who is recovering after a phase of ill health. The flower also stands for loyalty and strong bonds between people. So it's a lovely gift to a close friend as well. The flower is very popular in weddings and homes. If you're looking to bring a splash of warmth and high spirit, a bunch of these happy sunflowers is the perfect solution. You can get as creative with them as you want because they have sturdy stems. These flowers are eye-catching in an independent arrangement. If you're planning a wedding, you might want teddy bear sunflower delivery. And if you're decorating a reunion or a large event, you might want a chocolate sunflower delivery. Either way, your first choice should be Whole Blossoms. 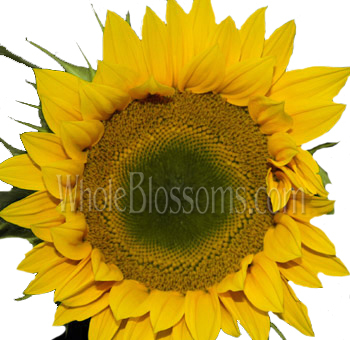 They have a large variety of sunflowers and provide 24/7 home delivery to your doorstep. 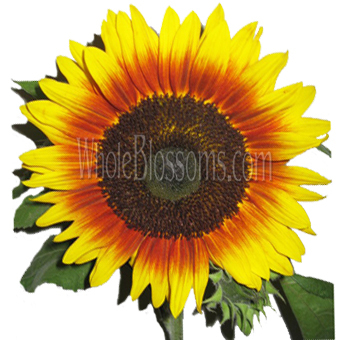 They are the best place to order cheap sunflowers online. 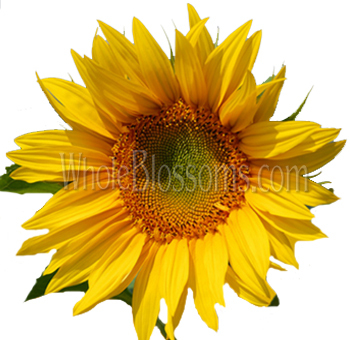 Buy a couple today and see the immense effect of sunflowers on your life!